Want to take your Blackboard Course to Next Level? Be Graphic! So, you’ve been at this Blackboard thing for a couple of semesters and you are starting to feel comfortable with the learning management system. You’ve mastered the art of uploading and attaching files to content. The discussion board is your boon companion and you are collecting assignments digitally from your students via the assignment tool. Navigating the grade center is like riding a bike and you feel good about it! What now? Learn a new tool or technology? Live inside your course for the next 6 months? Well, you could do those things, but let me suggest a slightly different approach. Have you considered adding an important layer to your Blackboard course by inserting images? 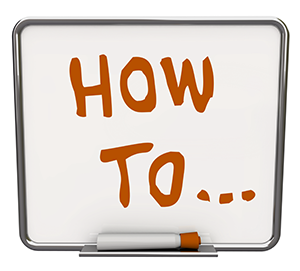 Convey course information in an alternate method. Students pay more attention to articles/readings with graphic content. Breaks up monotony of “text-only” Blackboard pages. Increases student engagement by making them use a different part of their brain. 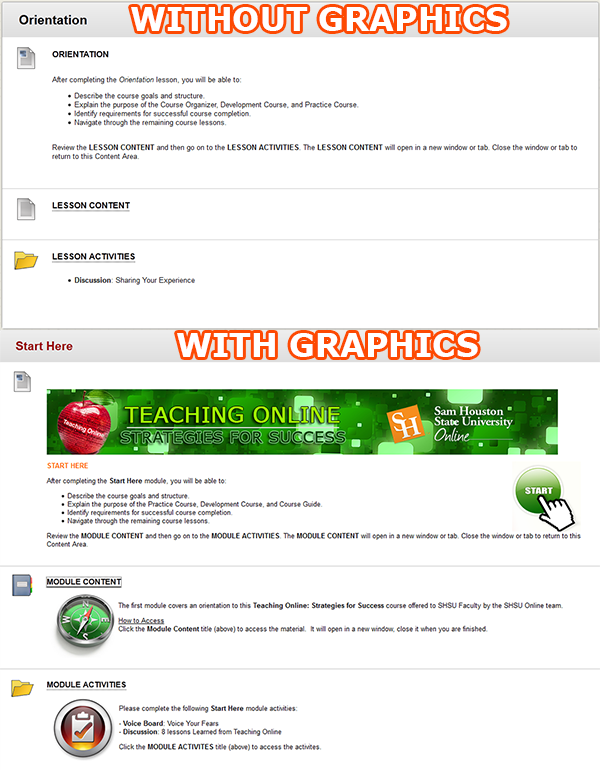 Below are examples of a Blackboard content area without graphics and a content area with graphics. Which one looks better? Which one would you rather read? In this example the graphics are more of the decorating variety, but they do add color and continuity to your course. Imagine having your course banner at the top of every major content area in your course. In this case there are examples of images in a content item, learning module and content folder descriptions. 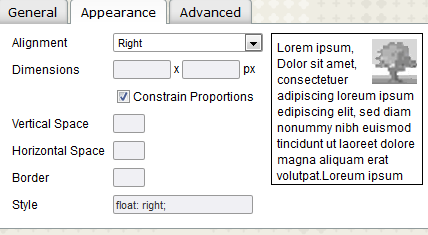 Almost anywhere you use the content editor in Blackboard, you can place an image. Click the Insert/Edit Image button on your content editor. Browse to where your image is saved and attach it. Type an Image Description (for screen readers). Click on the image you have placed in the Content Editor. Adjust your Alignment, Spacing and Size. With a few clicks of your mouse, your Blackboard course can go from black and white text to a colorful tapestry of text and images that convey meaning to students in a number of different ways! Summer is upon us! Thankfully, summer brings with it warmer weather and relaxed schedules. Why not use a tiny bit of your summer to brush up on your instructional technology skills? The DELTA Center will be offering sessions all summer long that can directly benefit you! Below you will find information about our second fully-online cohort of the Teaching Online With Blackboard Certification Series as well as a list of our face-to-face classroom based how-to sessions. 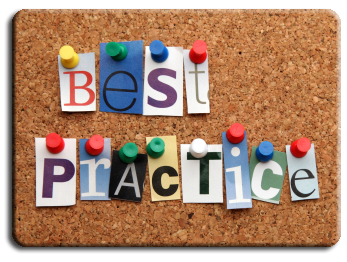 All Summer long, from the beginning of June to the end of August we will be offering how-to sessions on instructional technologies and best practices in the CJC A185 Training lab. Here is a list of courses we are offering. Sign-up Today! Blackboard Learn Adaptive Release: This session covers how to release course content to your student based up certain rules you set up as the instructor. Imagine blocking access to your course until a student completes a Syllabus Quiz for example. Achievements – Badges in Blackboard: This 1 hour session will help you Gamify your Blackboard course with badges & certificates. The achievements tool allows instructors to designate criteria for issuing rewards to students. Much like the Early Warning System, rules can be set as the criteria for issuing achievements. Unlike the Early Warning System, the achievement tool rewards students for their accomplishments, rather than punishing or identifying detrimental behavior. Students can see which rewards they’ve earned and what is required of them to receive additional rewards. Blackboard – 1st Week Strategies: Studies have shown that the first week of an online course is key for your students. The activities and interactions that take place in that first week can influence the rest of the semester. There are strategies that you can employ that ensure that the start of your course that will help you and your students have a successful learning journey. This 1 hour session will outline activities, ideas and strategies you can use during the 1st week of your course. Blackboard Learn Copying Course Content: This 1 hour session covers how to copy in part or in whole, course content from one course to another as well as within one Blackboard course. Blackboard – Plagiarism Defense: A 1 hour session that covers Blackboard SafeAssign. SafeAssign is Blackboard’s plagiarism prevention assessment tool. A SafeAssignment helps educators prevent plagiarism by detecting unoriginal content in student papers. In addition to acting as a plagiarism deterrent, it also has features designed to aid in educating students about plagiarism and importance of proper attribution of any borrowed content. 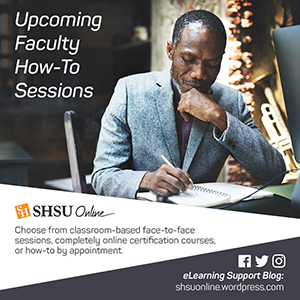 Blackboard Learn – Course Building: This course is the first in a three-part series that will ensure you are well acquainted with Blackboard @ SHSU. Become familiar with the Blackboard environment including: layout, navigation, adding, editing and deleting content. Attendees will gain control over their course’s navigation menu and learn how to interact with their courses from an instructor role. Blackboard Learn – Communication: This course is the second in a three-part series that will ensure you are well acquainted with Blackboard @ SHSU. Learn how to communicate and collaborate with your students using Blackboard’s on-board set of tools. Announcements, Notifications, Email, Discussion Boards, Blogs, Journals and Wikis will all be covered. Blackboard Learn – Assessment: This course is the third in a three-part series that will ensure you are well acquainted with Blackboard @ SHSU. Attendees will learn how to assess student progress with Blackboard Assignments, Turnitin Assignments, Test/Quiz/Survey Creation and how each of these interact with the Blackboard Grade Center. Respondus Lockdown Browser: Assessment Protection: Respondus LockDown Browser™ is a custom browser that locks down the testing environment within Blackboard and other LMSs. When students use Respondus LockDown Browser they are unable to print, copy, go to another URL, or access other applications. When an assessment is started, students are locked into it until they submit it for grading. Incorporating Video in a Blackboard Course: This course will make the instructor familiar with the different ways to add video to a Blackboard Course. YouTube Mash-ups, Kaltura Video & Video Everywhere will be covered as well as DELTA Video services. Blackboard Learn – Connecting Your Course: This 1 hour course will cover connecting your course by organizing, clearly naming your navigation elements, providing mechanical instructions and having an “escape route” will save your students and ultimately you time when putting together your online course.